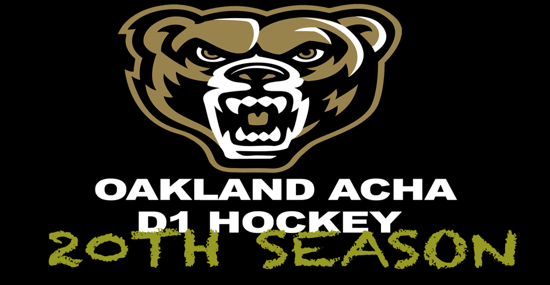 This season, which begins on Friday, September 28th, marks 20 seasons of Oakland ACHA Hockey. The program started as an ACHA DII team in the 1999 season and in the previous 19 seasons, Oakland has won two ACHA DII National Championship, an ACHA DI National Championship, a GLCHL regular season and a GLCHL Playoff Championship. The program has a record of 394-248-43 overall and a record of 231-191-28 in ACHA DI. Two Oakland players have been inducted into the ACHA Hall of Fame; forward Will McMahon in 2010 and forward Brent Cooper in 2015. Nick Field, takes the helm of the Golden Grizzlies as the new head coach to start the 20th season of OU Hockey. Defenseman Jarrett Samp represented Team USA in Harbin, China in 2009. Defenseman Jacob DeSano and forward Kevin Kranker represented Team USA in Erzurum, Turkey in 2011. Forward Billy Balent represented Team USA in Italy in 2013 Trentino, Italy, Named to the team in Granada, Spain in 2015.